Re-using or re-purposing industrial shelving throughout your warehouse can save your company a lot of time and money. Often times shelving can be disassembled and reassembled in a new location without a hitch, although this needs to be done very carefully. It’s very important in the tear-down process to clearly label the parts and products, and also to take an inventory count on damaged or missing products. One of the most common products that need to be replaced when preforming a relocation of shelving is the shelving clips themselves. This is understandable, because the clips are the smallest component of the system and are easily thrown away in the move. At Shelf-clips.com, we often work closely with industrial installers who are in need of replacement clips for the used shelving system they’re installing. Typically, they do not know what type of shelving system they are installing, so they need to utilize our shelf-clips identifier to initially identify the shelving they have. They are almost always on a time crunch as well, so they quickly order the clips through our online store and proceed to use the next day UPS shipping feature. Before you know it, they are finishing their project. The shelf clip identifier is one of the most helpful tools we offer our clients, and was created when the website began in 2010. We found that many industrial shelving clips looked very similar to each other, and often found ourselves needing to help people identify which shelving system they had in order for them to be able to order clips. For example, two of the clips featured on our identifier are the Republic 1 and Republic 2 clips. These clips share the same standard compression design as many other clips in the industry, but also have some distinct features that are explained below. Shelf clip shall be made from 13 gauge, hot-rolled, pickled and oiled steel. Width 29/32″, overall length 3-17/64″. Finish shall be bright zinc plated. “Republic” is stamped on the inside surface of shelf clip. 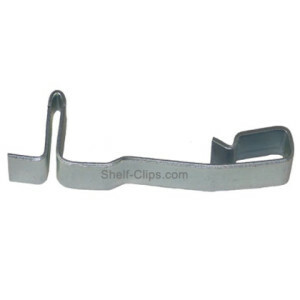 Shelf clips are available in packages of 100, or can be bulk shipped in cartons. Four shelf clips per shelf are automatically furnished with Open Flange and Series 2000 Clip Shelves. Half shelf clip shall be made from 13 gauge, hot-rolled, pickled and oiled steel. Width 29/32″, overall length 2-11/32″. Finish shall be bright zinc plated. When 1-1/2″ bases are ordered, 4 half clips are automatically furnished. By showing pictures of the clips and clearly identifying each clip’s characteristics, our customers are easily able to identify whether they’re in need of Republic 1 or Republic 2 clips. Both clips are available in our online store and can be purchased in boxes of 50.